WL12 inhibits interaction between PD-1 and PD-L1 therapeutics in vitro. (A) Schematic representation of the assay. (B) WL12 inhibits Cy5-conjugated AtzMab, AveMab, and DurMab binding to PD-L1, as demonstrated through competitive inhibition and corresponding IC50 values. Mean fluorescence intensities (MFIs) were determined by flow cytometry. (C) Schematic representation of the assay. 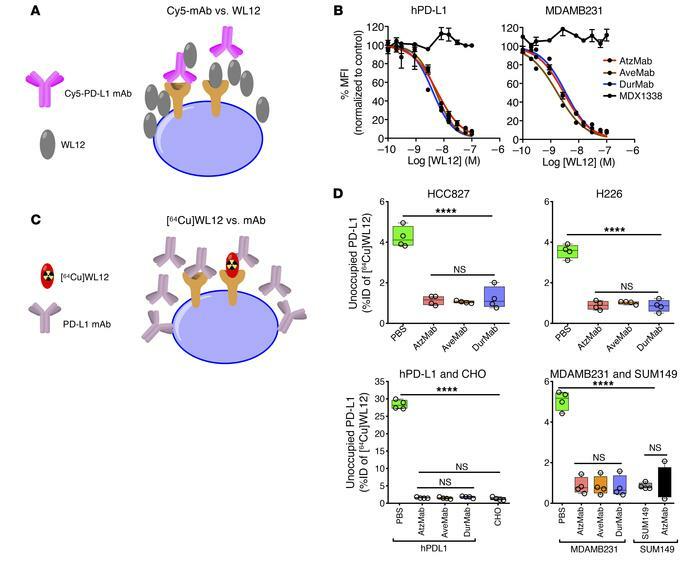 (D) [64Cu]WL12 binding to PD-L1–positive HCC827, H226, hPD-L1, and MDAMB231 cells is inhibited in the presence of 60 nM AtzMab, AveMab, and DurMab, compared with PBS control. [64Cu]WL12 binding in PD-L1–negative CHO and SUM149 cells is also shown. ****P < 0.0001; NS, not significant, by 1-way ANOVA and Dunnett’s multiple comparisons test in D.